UPDATED: Tue., April 9, 2019, 7:47 p.m.
At precisely 13:00 Universal Time on Wednesday – 6 a.m. Pacific – scientists will hold simultaneous news conferences in Washington, D.C., Belgium, Denmark, Chile, Japan, China and Taiwan to reveal the long-awaited results of the Event Horizon Telescope. What everyone is expecting and hoping to see is the first direct image of a black hole. The Event Horizon Telescope is a network of 10 radio telescopes on four continents that collectively operates like a single instrument nearly the size of the Earth. The scientists behind this megatelescope boast that their ability to resolve objects in deep space is equivalent to being able to count the dimples on a golf ball in Los Angeles while standing in New York City. Einstein found the notion of a singularity so preposterous that he devoted an entire research paper to debunking it. But as time went on, more researchers found more clues that Schwarzschild’s wild idea might be real. 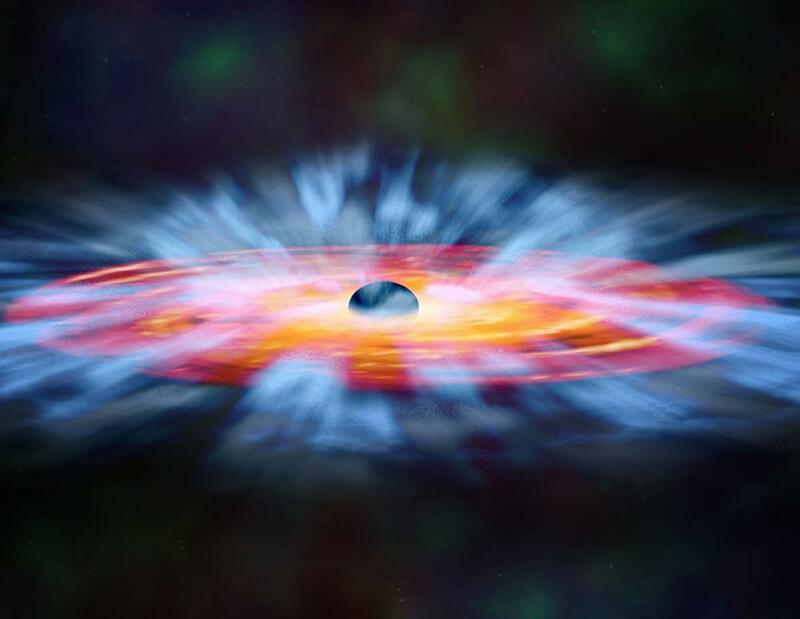 In the 1960s and ’70s, scientists proposed that some mysteriously bright objects they’d been calling quasars might actually be clouds of swirling, superheated material surrounding black holes hundreds of thousands of times more massive than the sun. As these “supermassive” black holes slurp up gas and stardust, the theory goes, matter outside the event horizon speeds up, and some of it is flung back into the outer reaches of galaxies. X-rays and radio waves accompany these jets of ultrahot gas. Paradoxically, all this activity makes these black holes some of the brightest things in the universe – and obscures the darkness at their cores. The Event Horizon Telescope has looked at two supermassive black holes: Sag A* and the one in M87 (for Messier 87, named for the astronomer who cataloged galaxies in the night sky before anyone knew exactly what a galaxy was). M87 is a truly enormous elliptical galaxy in the constellation Virgo. Whereas the Milky Way’s central black hole has a mass equal to 4.3 million suns (or “solar masses”), the black hole in M87 is more like 6 billion solar masses – billion with a b. M87 is remarkable for producing a dramatic jet of particles streaming some 5,000 light years into intergalactic space. Published: April 9, 2019, 3 p.m. Updated: April 9, 2019, 7:47 p.m.